This article caught my attention as I immediately recognized the same interest as our practice shares. 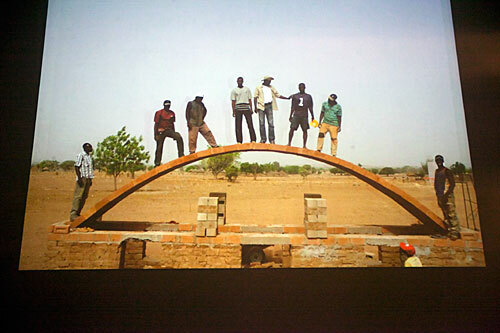 An African architect gives a lecture at Harvard on the strong sense of place of a project. Diébédo Francis Kéré speaks about schools in Africa, emphasizing the lack of education and the lack of money which leads to people building their houses by copying their neighbors. He points out that African schools don’t necessarily have to be a „technical transplant” of Western styles, but they should be built accordingly to to the climate, local materials and resources, combining traditional and modern techniques. As the majority of buildings are made our of clay in a few days, they need repairs after each rainy season. He explains how he himself studied in a clay box covered with tin roof, which felt more like an oven rather than a class. Kéré tells the audience how he designed a school in Gando, using local soil to make the clay bricks and how the population got directly involved in the process of making: the women spread the clay on the floor and beat it to give it a sand-like look and local drummers established a rhythm so the weakest and the strongest would be the same. They used only local materials and human resources (as they had no other choice) and built the school in nine months. After ten years it is still in the same shape as it was in the first day. The village has become famous and the people are proud – it’s impressive how much one can do when the community get involved and how motivated people are to build something for themselves. I personally think this is a key aspect in a design (and a trick for an architect) to employ local people in the process and in the end it’s not only going to be a successful project but a rewarding one. Talking about another school that he was commissioned to design in Dano with a budget of only 70.000 euros, he presented his architectural principle or „more for less”, finding the right people who fight to get more for less money, which of course happened to be local people again. In Mali, working on another project, Kéré built a museum of local clay and rock with bricks manufactured on-site. A controversial multi programme tower is rising in London, a „vertical city” as the architect calls it will be the tallest building in Western Europe. But does it sit perfectly in the city or is it misplaced? I have heard a theory that St Paul’s is supposed to be seen from any high point of London, but the Shard is taking over blocking a certain view to St. Paul’s. At the same time, the architect claims that they wanted to make this tower respected by Londoners as St. Paul’s, which is contradicting. To be honest, I personally thought it doesn’t fit in the surroundings of London before I came across this interview. It seems like the most important aspect in everyone’s minds was the mixed-use of the building, being able to provide life in the city without increasing the traffic – as the building sits in a vital place of interchange. The Shard is going to house office space, a 5-star hotel, residencies and restaurants with an amazing view. One aspect explained in the interview that particularly interested me was the reusage of energy due especially to this mixed-use. The extra heat produced by the offices is going to be reused in the residential part. This made me think of my personal project in Brick Lane which is also a mixed-use building. Perhaps I can reuse the extra heat produced in the workshop by all the machines for the living spaces. But my concern about this tower is still there: how exactly does it fit with its surroundings? For me it still looks like it belongs somewhere in Dubai or China. Usually towers have a bad reputation because they are a symbol of power and arrogance, trying to win the title of „the tallest building” even if only for a few months. 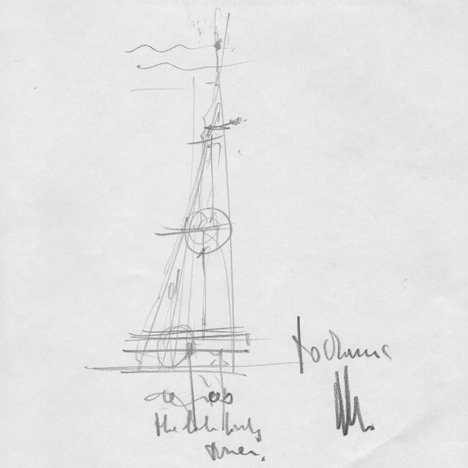 But Piano’s argument is that the idea behind this tower was not to break any record but rather to breath fresh air. Visiting this small practice in Highgate was more useful than I ever expected it to be, in a sense that it somehow opened my eyes to what a real practice involves. Around 20 of us, eager first year students, invaded David Kohn’s studio –that could barely fit the 20 of us around a table – in search of some answers about the real world experience as an architect. He told us how he set up his practice, first in his own flat that he deliberately bought having a spare room that he could turn into a studio. As an answer to what has influenced him in making a decision regarding what kind of practice he wanted to run and what type of architecture he was interested in, he said that chance plays an important role as does who you work for after you graduate and also who teaches you (after his third year he stayed and worked for his third year tutor). A very intriguing aspect was the fact that only 50% of the time is spent on actually working on a project so the income of an actual project just pays for the rest 50% of competitions to find a project, lectures, writing in brochures, keeping the studio reputation in the clients’ minds. I found it immensely useful to talk to an architect and find out all these details that are mostly unknown to the general public who thinks that architects have so much money and no worries at all. Visiting the Oma/Progress at the Barbican Centre this week was an enlightening experience as I got “behind the scenes” of buildings that before I had only seen as a final solutions. This gave me the other perspective, the building as a series of problems or questions before being resolved. One of the first things I noticed when entering the exhibition was this quote: “Start anywhere. Ask stupid questions. Stay up late” . I liked it because it relates very much to our current experience as architecture students and it is comforting to know that even world renown architects lead themselves (or better said, their work) after a simple statement like this. The “Casa da musica” project revealed some interesting new facts: plane glass reflects sound waves in all directions and is therefore almost never used in concert halls. For this auditorium, OMA developed corrugated glass. Also, for a completely transparent well that reaches up to 8m height without additional structure they used glass tubes. This gave me an idea for my current project as one of the things I am interested in is points of view from the street level. I find the way the office manages buildings of all scales impressive, knowing the fact that usually practices focus on a specific type of buildings in which they have expertise. It was a very inspiring exhibition which opened my eyes a little bit more regarding the process behind a final design.